Add Acidaminococcus sp. CRISPR/Cpf1 monoclonal antibody to my shopping cart. Request a quote for a bulk order for Acidaminococcus sp. CRISPR/Cpf1 monoclonal antibody. Please fill out the form here below. Your local sales account manager will get in touch with you shortly and send you a quotation based on your requirements. 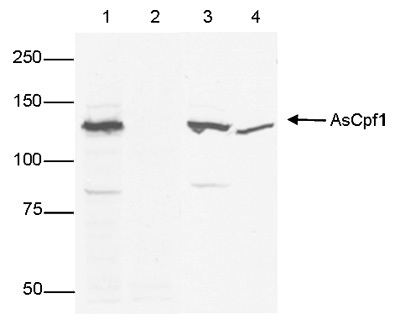 Monoclonal antibody raised in mouse against Acidaminococcus sp. (As) Cpf1 (CRISPR from Prevotella and Francisella 1) using a recombinant protein. Western blot was performed on protein extracts from HEK293 cells transfected with HA-tagged AsCRISPR/Cpf1 (lane 1, 3) or HEK293 cells transfected with HA-tagged LbCRISPR/Cpf1 (lane 2, 4) using the Diagenode monoclonal antibody against AsCRISPR/Cpf1 (cat. No. C15200234), diluted 1:1,000 in PBS-T containing 0.5% NFDM (lane 1 and 2). Lanes 3 and 4 show the WB result with an antibody against the HA-tag. Diagenode strongly recommends using this:	Acidaminococcus sp. CRISPR/Cpf1 monoclonal antibody (Diagenode Cat# C15200234-100 Lot# 001). Click here to copy to clipboard.